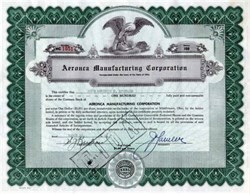 Beautifully printed certificate from the Aeronca Manufacturing Corporation issued in 1951. 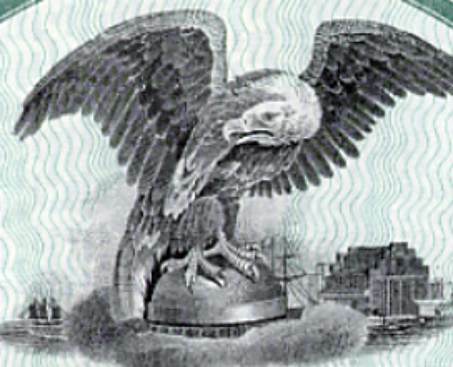 This historic document was printed by the Goes Lithograph Company and has an ornate border around it with a vignette of an eagle which landed on top of a dome. This item is hand signed by the Company's President and Secretary and is over 60 years old. The Aeronautical Corporation of America (Aeronca) was incorporated by the Lunken family of Cincinnati, Ohio on November 11, 1928. Backed by the financial and political support of the prominent Taft family�future Ohio senator and U.S. Supreme Court Chief Justice Robert A. Taft was one of the firm's directors�Aeronca became the first company to build a commercially successful light aircraft. Between 1930 and 1951 Aeronca produced 17,500 general aviation and military aircraft, and in 1952 began subcontracting the production of flaps, ailerons and bomb bay doors to Boeing Corporation. The company changed its name to the Aeronca Manufacturing Corporation in 1950. Equipped with only five instruments, a stick, and rudder pedals (brakes and a heater cost extra), the C-2 was priced at a low $1,495, bringing the cost of flying down to a level that a private citizen could aspire to and perhaps reach. Aeronca sold 164 of the economical C-2s at the height of the Great Depression in 1930-1931, helping to spark the growth of private aviation in the United States. The Aeronca C-2 also holds the distinction of being the first aircraft to be refueled from a moving automobile. A can of gasoline was handed up from a speeding Austin automobile to a C-2 pilot (who hooked it with a wooden cane) during a 1930 air show in California. A seaplane version of the C-2 was also offered, designated the PC-2 and PC-3 (�P� for pontoon) with floats replacing the wheeled landing gear. The more powerful Aeronca C-3 was introduced in 1931, featuring room for a passenger seated next to the pilot. Powered by a new 36-horsepower (27-kilowatt) Aeronca E-113 engine, the seating configuration made flight training much easier and many Aeronca owners often took to the skies with only five hours of instruction�largely because of the C-3's predictable flying characteristics. Both the C-2 and C-3 are often described as �powered gliders� because of their gliding ability and gentle landing speeds�it was almost impossible to make a hard landing with an Aeronca because the pilot could easily see his wheels approach the runway. The C-3's distinctive razorback design was drastically altered in 1935 with the appearance of the �roundback� C-3 Master. Retaining the tubular fuselage frame construction, the C-3 Master featured a smaller vertical stabilizer and rudder with a �filled out� fuselage shape that created the new �roundback� appearance and improved the airflow over the tail. With an enclosed cabin (brakes and wing light still cost extra), the 1935 C-3 Master was priced at only $1,890�just a few hundred dollars more than the primitive C-2 of 1929. The low price generated significant sales; 128 C-3 Masters were built in 1935 alone and the 500th Aeronca aircraft also rolled off the assembly line that same year. A version of the C-3 with fabric-covered ailerons (instead of metal), designated the Aeronca 100, was built in England under license by Light Aircraft Ltd. (operating as Aeronautical Corporation of Great Britain Ltd.) but the expected sales never materialized�only 24 Aeronca 100s were manufactured before production was halted. Production of the C-3 was halted in 1937 when the aircraft no longer met new U.S. government standards for airworthiness. Many of the C-3's peculiarities�external wire braces, extensive fabric construction, single-ignition engine, and lack of an airspeed indicator�were no longer permitted. Fortunately for the legion of Aeronca owners, a �grandfather� clause in the federal regulations allowed their airplanes to continue flying, although they could no longer be manufactured. Aeronca developed a low-wing aircraft in 1935, the Model L (produced with two different engines) with side-by-side seating and a completely enclosed cabin, but the true successor to the popular C-2/C-3 line was the Aeronca Model K Scout, first introduced in 1937. Powered by a dual-ignition Aeronca E-113C engine, the Model K Scout brought the Aeronca design up to modern aviation standards. Eliminating the Aeronca's traditional �bathtub� appearance, the Scout featured a strut-braced wing with a fully enclosed cockpit seating two side-by-side. A total of 357 Aeronca Model K Scouts were built. Consumer demand for more comfort, longer range and better instrumentation resulted in the development of the Aeronca Model 40 Chief in 1938, powered by a 50-horsepower (37-kilowatt) Continental, Franklin or Lycoming engine. A 65-horsepower (48-kilowatt) Continental engine powered the Model 65 Super Chief, which was also built in a flight trainer version, the Model TC-65 Defender, with its rear seat positioned nine inches (23 centimeters) higher than the front for better visibility. Aeronautical Corporation of America formally changed its name to Aeronca Aircraft Corporation in 1941, and the onset of World War II ushered in a new era for Aeronca aircraft. Production of the TC-65 Defender was increased for use by the U.S. government's new Civilian Pilot Training (CPT) program, created to train new pilots for possible wartime service. In 1942, Aeronca developed a three-seat training glider, the TG-5, based upon the O-58 design. This aircraft retained the O-58's rear fuselage, wings, and tail while adding a front fuselage in place of the engine. In all, Aeronca built 250 TG-5 gliders for the Army. The O-58 was later redesigned for the Army and designated as the L-3. More than 1,400 Aeronca O-58 and L-3 Grasshoppers saw service in all theaters of the war. Aeronca also built the PT-19 and PT-23 trainer aircraft under license for the aircraft firm Fairchild during the war. After war's end, Aeronca resumed production of its three most popular models, the Chief, Super Chief and the Defender, and introduced a new model in 1945, the Model 7AC Champion. Certified on October 18, 1945, the �Champ� became Aeronca's most popular aircraft. The Champion was a tandem two-seater trainer that incorporated components (wings, landing gear, tail, and 65-horsepower (48-kilowatt) Continental engine) from the existing Chief line, reducing manufacturing costs. Selling for $2,095, the Champ outsold the Chief by an 8 to 1 margin. Engine upgrades in 1948 and 1949 resulted in the Models 7DC and 7EC. Between 1945 and 1950, Aeronca was producing 50 light aircraft per day and by the time production ended in 1951, the company had sold more than 10,000 Champions. The Arrow, an experimental low-wing cabin monoplane with retractable landing gear, was unveiled in 1947 but never went into full production. Another U.S. Army liaison aircraft, the L-16, was developed and saw extensive service during the Korean War. The four-seat Model 15 Sedan, also introduced in 1947, proved to be a popular addition to the Aeronca product line. The Sedan featured all-metal wings but retained the traditional tube and fabric construction techniques of all Aeronca aircraft. It also became quite successful as a floatplane. Ultimately, 561 Model 15 Sedans were built. It was the last aircraft manufactured by Aeronca. History from the Centennial of Flight Website.